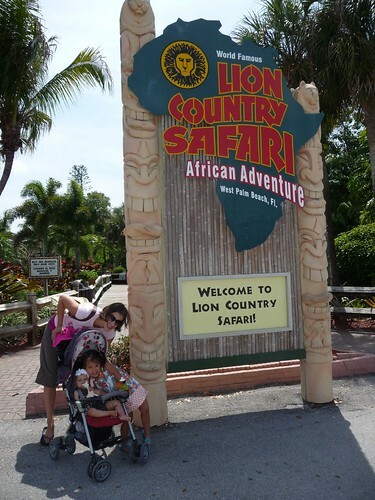 Mali Mish – Day 70: Lion Country Safari. Today, we finally had a reason to clean the windows of the van for the first time in a long time. Since the beginning of our trip, we have not yet washed either the van or the Airstream. The occasional rain has help a bit in washing off any big chunk of dirt but if we wanted to get nice pictures through these windows today, they are going to need to be spotless. 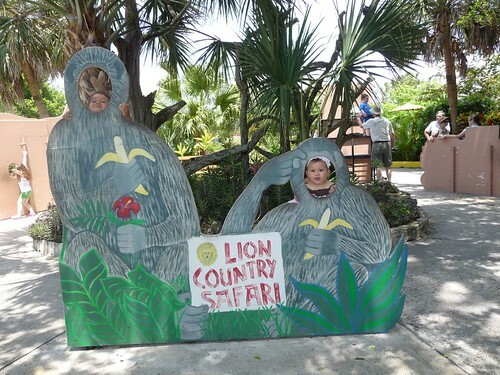 That’s because we are going to be visiting Lion Country Safari, the first drive-through zoo in the country. 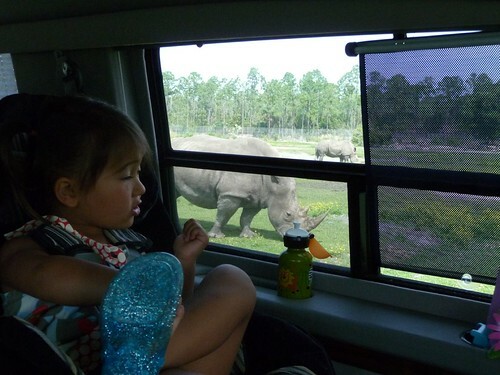 Part of the rules of driving your car through the zoo is that you do not, for any reason, open the windows and doors to your car. That’s unless you are okay with being mauled by a lion. 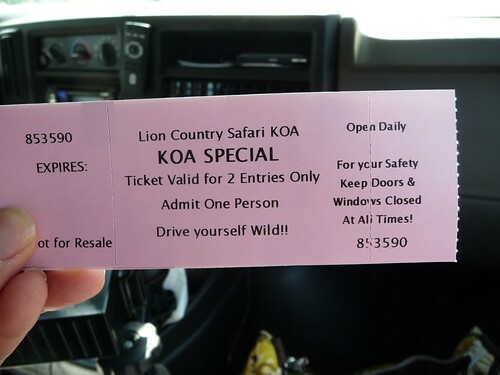 The Lion Country Safari KOA offers a standing special that includes admission to the zoo and 2 nights stay for $105. Being that the zoo entrance fees alone is $25 per adult, it is a pretty good deal. The special deals essentially gets us into the zoo for free for just the price of camping. I had been worried about what kind of damage these animals might do to my car before coming in here. 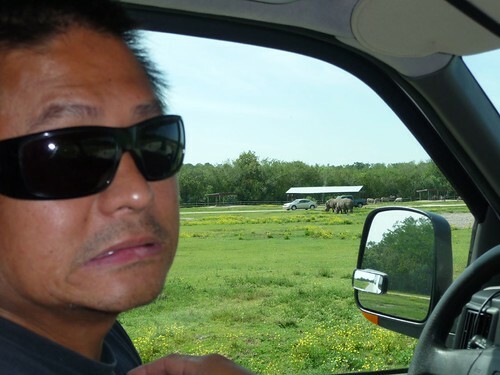 From doing some research online, people have talked about retracting your antenna so the monkeys don’t rip them off or not spooking the rhinos so they don’t charge your vehicle and rip a hole right through it. 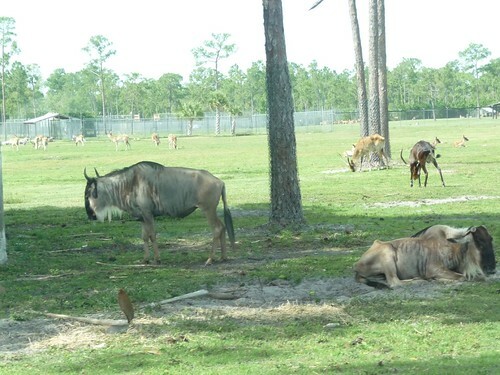 Well, at least these wildebeests are taking it easy on this hot day. 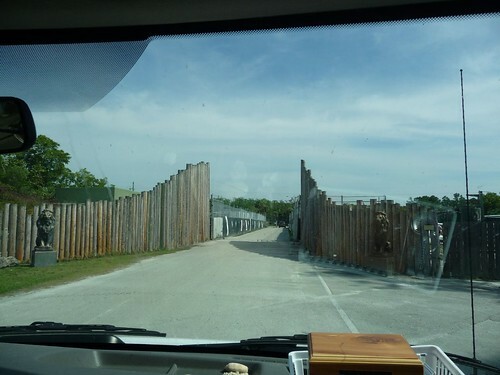 When we got to the lions exhibit, we noticed that there is an extra set of fences that sections off the lion pride from the visitors as well as the other animals. I guess it makes sense. 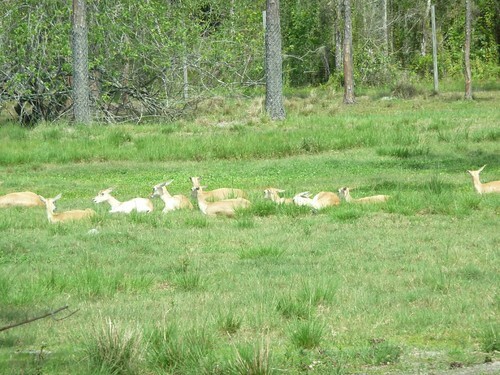 If they didn’t segregate them, sooner or later there would only be lions left here. These guys sure look like they are glad to have those fences in place. 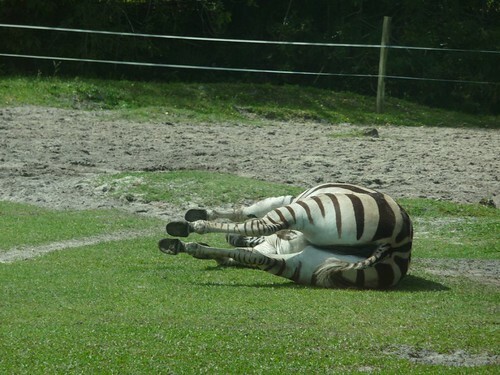 We did find some zebras that were not quite as docile and relaxed as the others. 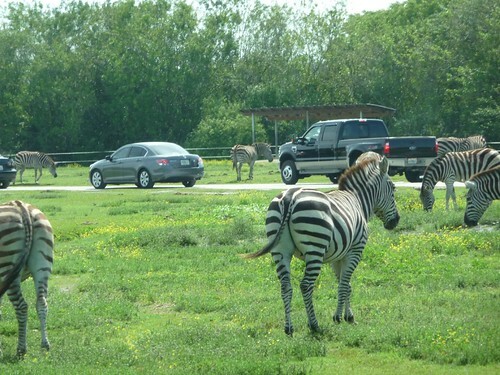 They roamed pretty freely around our cars as we drove through the area at the mandated 8 MPH speed limit. 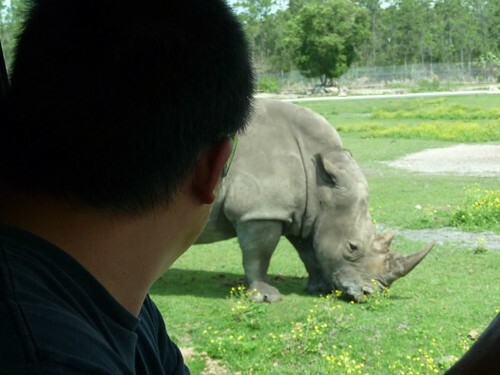 Out there in the distance, is the rhinoceros. I sure hope he’s not interested in seeing the bottom of the van. It is pretty amazing how big these guys are. Especially when you realize they got this big by eating nothing but grass. Whew! That was a close one. Luckily I sped up just in time so this poor zebra got the shaft instead of me. 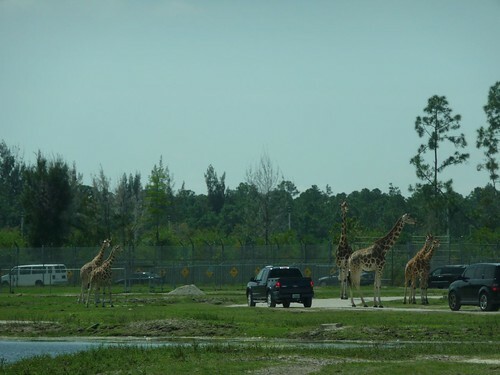 As far as big animals go here at Lion Country Safari, the giraffe has to be some of the most impressive animals to drive next to. There are probably more than a dozen giraffes here and when they walk next to your car, all you see are legs. 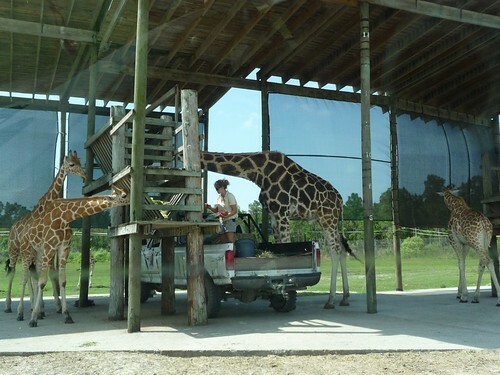 One of the zookeepers has to stand on the back of her truck just to bring their food high enough for them to eat. The safari took probably no more than 30 minutes to get through from beginning to end. You are allowed to drive through as many times as you’d like but we thought once was enough. 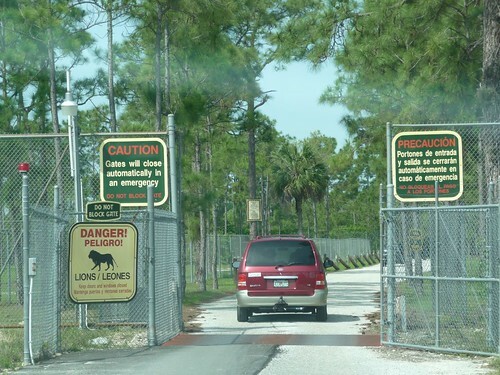 The other park that is part of the price of admission has its entrance right at the end of the safari tour. 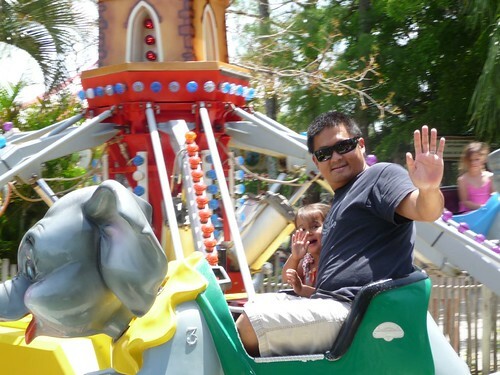 Pretty much all of the rides at the park are kid friendly and Ava was big enough to ride on whatever she wanted to. Although this “Dumbo” ride I was told to go along with her even though I had doubts that the hydraulics wouldn’t collapses under my weight. 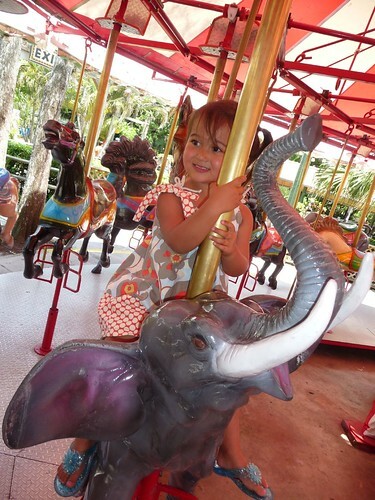 Ava, probably like most kids, loves the merry-go-round. 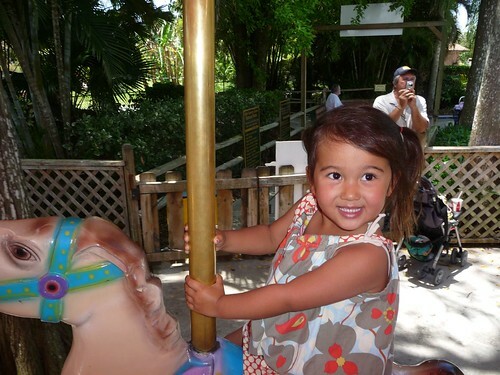 All of the rides here had pretty much no lines so she got to ride it as many times as she wanted. She even got brave enough to get in this ferris wheel with me. 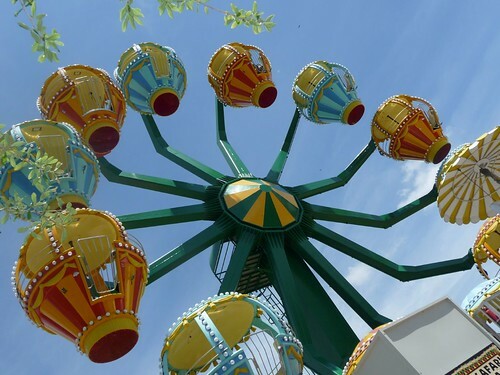 Last time we rode a ferris wheel was last summer at the Ventura County Fair. She pretty much shut the circulation off of my arm from holding on to me so tightly. 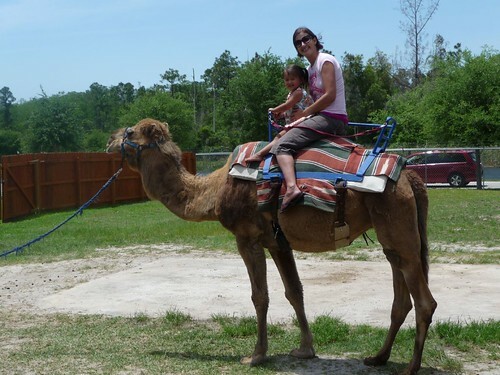 When I was a kid just a little older than Ava, I remember going on a camel ride during a visit to New York. A picture of it sat on top of my grandparents TV for as long as I can remember. 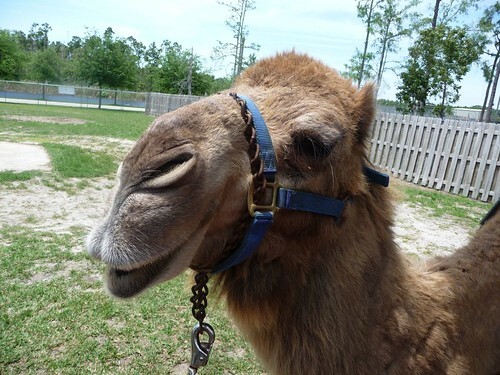 Unlike the rest of the attractions here which is included with the entrance fee, the camel ride costs an extra $5 per person. 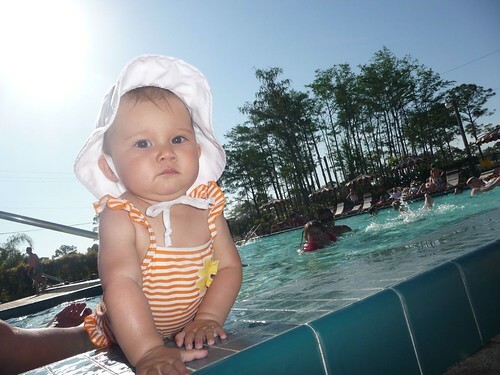 According to Marlene and Ava, it was ten bucks well spent. 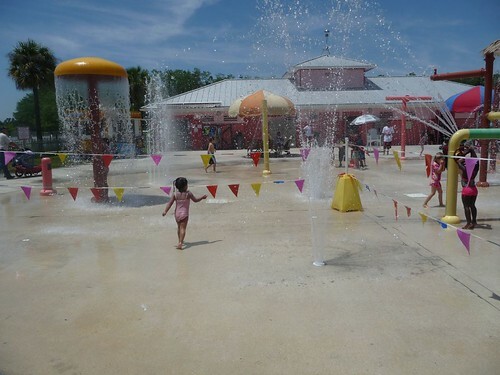 We wrapped up the day at the park with Ava zigzagging through the splash area while we took a break in the shade before heading back to the KOA right next door.